When refilling and using original/genuine HP 940 or 940XL ink cartridges (tanks) in your inkjet printer, you will observe ‘low ink’, ‘ink out’ or ‘ink empty’ alert messages and warnings. HP does not allow an automatic reset of the electronic chip on the cartridge after a refill, so the ink level indicator is sending a false message that the ink level is low. Your cartridge is not low on ink, and nothing is wrong with your printer or cartridges. Simply dismiss these messages to continue printing. 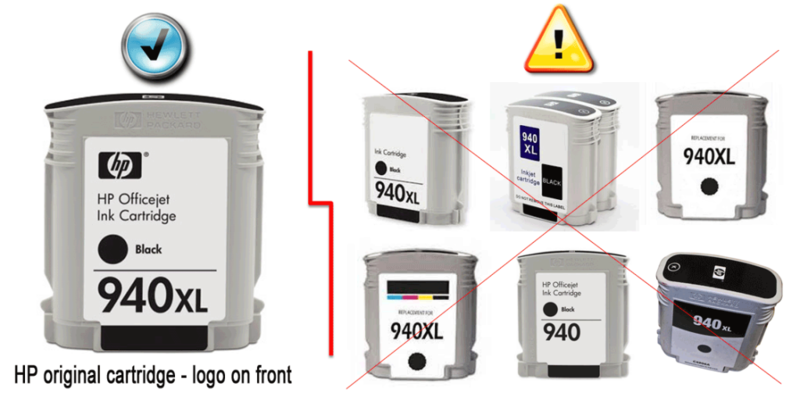 “Empty” and “Low Ink” alerts are COMPLETELY NORMAL for HP 940 & 940XL ink cartridges which have been refilled! While at first this may be an unusual workflow, it does allow print operations to proceed. Refer to video & NOTE below…. NOTE: A compatible, remanufactured or re-branded HP 940/940XL ink cartridge can be problematic; the smart chip (at base of cartridge) may not provide reliable printer-cartridge connectivity once installed. 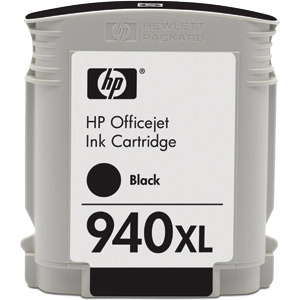 Compatible cartridges are typically purchased on-line or at select retailers (i.e sold under a different label than the regular HP cartridge packaging) and is essentially a “remanufactured tank” of the HP original/genuine ink cartridge. For the best refilling experience, only use HP original/genuine ink tanks. It is suggested to follow these general guidelines to help maximize print quality output and maintain a healthy printer. If your ink cartridge suffered an electronic or physical failure or you are unable to find a refill store close to you may we suggest you try a remanufactured ink cartridge from our on-line web site. Our ink cartridges have a high reliability rating, come with a 1-year warranty and we provide free shipping for all orders above $20 (USA residents only). HP 940XL ink cartridges have had their smart chips replaced so ink level monitoring will be available.